The PHENIX Experiment is one of the largest high energy nuclear physics experiments in the world currently accumulating data at the Relativistic Heavy Ion Collider (RHIC) at Brookhaven National Laboratory in New York. Physicist John Haggerty said the RHIC's main mission is creating extremely high temperatures and pressures by colliding atomic nuclei at high energy. "The Experiment consists of many thousands of channels of digitizing electronics which creates 5,000 per second of collisions between gold nuclei moving close to the speed of light," he explained. "When they hit, the nuclei may create just the right conditions for the quark-gluon plasma to form." Haggerty said all these digitizers are controlled and configured via ARCNET. There are nearly 1,000 ARCNET nodes in eight networks with custom-designed interfaces and software using the SMC COM20051 microprocessor on eight networks. Custom software on the host computers configures and monitors the networks. The two host computers were Sun Solaris 2.6 SPARCStations with Contemporary Controls SBUS cards. However, Sun discontinued the use of the SBUS interface on the SPARCStations, making this implementation unavailable. Ultimately, Haggerty and his colleagues needed a replacement for the Sun Solaris servers and needed the simplest method to access an ARCNET network "We required a product that would allow us to continue using our large installed base of ARCNET devices despite changes in the computing and software environment." Knowing the reliability of products from Contemporary Controls, Haggerty selected the company's AI-SRVR-1/485 to replace the Sun servers. The Experiment is now preparing software that will use the AI-SRVR to configure and monitor these ARCNET networks without the need for a dedicated host computer. "It is very beneficial to do this in an embedded processor which we don't have to upgrade or maintain," he explained. "These small, low-power modular embedded systems will allow access to the ARCNET networks from any computer on the Ethernet network, and give greater flexibility in the deployment of networks at lower cost." Haggerty also chose the AI-SRVR because it would spare him the development and maintenance of a kernel driver for the PCI20 ARCNET interfaces that would otherwise be required in the Linux servers. The AI-SRVR provides connectivity between ARCNET networks and Ethernet. In the PHENIX Experiment, the AI-SRVR is operating in the standard mode. The standard mode allows Ethernet connected devices to communicate with ARCNET devices through the AI-SRVR. As mentioned earlier with reference to the software, Haggerty has written a class library in C++ that communicates with the AI-SRVR by means of socket reads and writes. His software allows commands to be sent to the nodes, and the node responses to be checked against typical responses. With the aid of the AI-SRVR, Haggerty and his team established a network architecture of eight ARCNET networks hosted by the AI-SRVR-1/485. 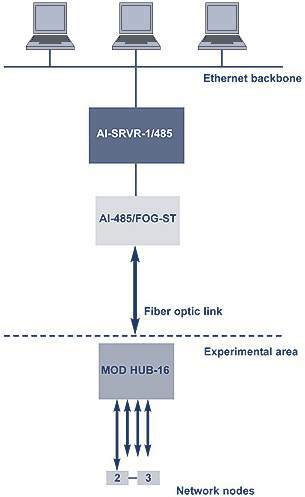 Since an AI-SRVR with a fiber optic transceiver is not available, Haggerty had to convert to fiber optics with the AI-485/FOG-ST Interconnect Hub. Just under 30 m of fiber optic cable extend the networks into the experimental area, where MOD HUBs and EXP modules convert the fiber optic media to as many as 14 segments of DC-coupled EIA-485 twisted-pair cable runs of up to 20 m. A simple diagram (below) illustrates the network architecture. Although not prepared to do so immediately, the physicists think they could eventually operate the AI-SRVRs in a manner allowing them to dispense with the need for fiber optics. "This would provide us the flexibility of having more ARCNET networks, with the concomitant increase in flexibility, reliability, and 'debuggability'," said Haggerty. The RHIC will continue to recreate QGP over and over again under laboratory conditions to gain further knowledge about the matter that makes up our world.